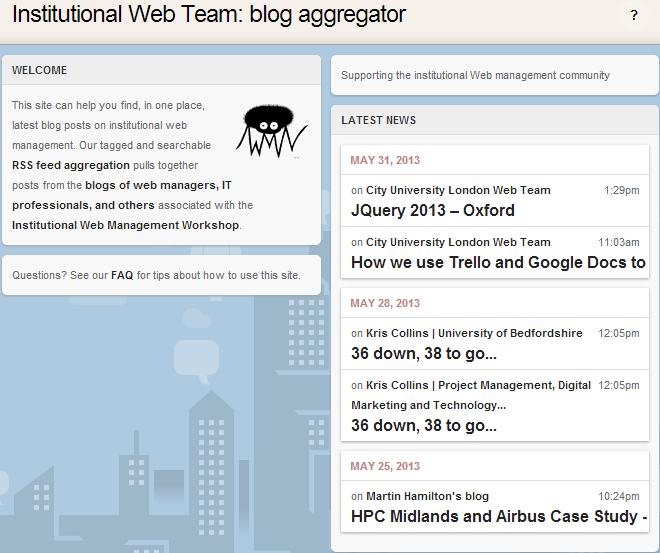 The Institutional Web Team Blog Aggregator was announced at the final session of the IWMW 2011 event held at the University of Reading. The aim of the service was to provide a centralised location which aggregates blog posts provided by institutional Web teams, by individuals who post primarily about their work in supporting institutional Web services or by others who support members of the institutional Web management community. In a post on “Sharing Job Information More Effectively” I gave an example of one additional use case was for ensuring that members of Web teams at other institutions could easily find details of job vacancies. However it’s probably fair to say that use of blog technologies as a simple mechanism for letting others know about the work being carried out in Web teams, plans for new areas of work and more general sharing of information hadn’t taken off to the extent to which I had hoped. In light of the forthcoming cessation of UKOLN’s core funding we are in the process of archiving our digital content and, where appropriate, shutting down services. This post provides notification of the closure of the Institutional Web Team Blog Aggregator. It should be noted that this should not mean the loss of significant content – the aggregator is a collection of blog content published elsewhere. If people find this aggregation of content useful I suggest that you visit the IWTB blog while it is still available, make a note of the RSS feed for blogs of interest to you and add them to your own blog reader. Note that we cannot guarantee that the service will continue to be available after 30 June. Despite the announcement only being made a few hours ago we are already seeing bloggers up in arms about the news. We might expect large-scale service such as TechCrunch (GoogleReaderpocalypse. For Real This Time.) to provide a speedy response to the news but closer to home bloggers such as James Clay have responded in blunt terms: Google Reader is Dead. What Does the Announcement Tell us About Open Web Standards? The implications of the demise of applications was always intended to be mitigated by use of open standards. But in this case the underlying format used by Google Reader (RSS) is widely accepted as an open standard in both its variants (RSS 1.0 and RSS 2.0). Blogs will continue to publish RSS feeds as will a variety of other tools and services. Why should the demise of Google Reader cause so much anger amongst users of the tool? As RSS grew in popularity we saw the development of a range of RSS readers. Initially we saw dedicated RSS clients which users installed on their desktop. We then saw RSS add-ons to existing tools, including RSS extensions for popular email clients such as Outlook. 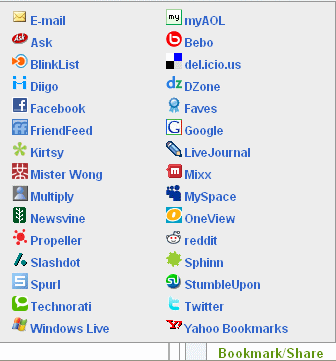 But the development of the “Web as a platform” led to a growth in popularity of Web-based RSS tools, which meant that users did not have to install software on their desktop computer (which was particularly useful for those with locked-down desktops and IT Service departments who were reluctant to install new software). 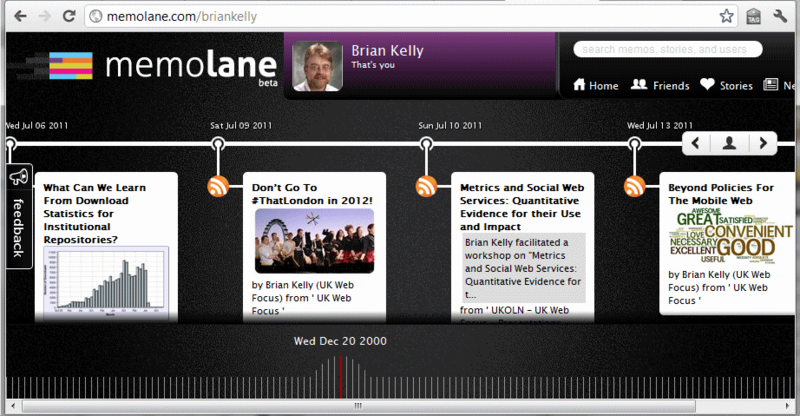 One of the early Web-based RSS readers was Bloglines. I used this service many years ago but haven’t logged in for several years. As I learnt from Wikipedia the service was scheduled to be shut down on 15 November 2010 but a last-minute reprieve meant that it continued under a new owner. However a few minutes ago when on to the service I discovered that the feeds that I had subscribed to had been lost. This was not a problem for me, as I have migrated by feeds to Google Reader. But now it seems that I will once again shortly be losing the service I use to view my RSS feeds. I should be able to export the list of my feeds held in Google Reader and return to Bloglines as my preferred RSS reader. However in reality it will not be so simple. I now use a variety of tools on my mobile devices (such as Flipboard, Currents, Pulse, etc.) to read my feeds, and use Google Reader as the intermediary for managing my large number of RSS feeds. I suspect I will be reluctant to wish to manage my subscriptions across a range of clients. 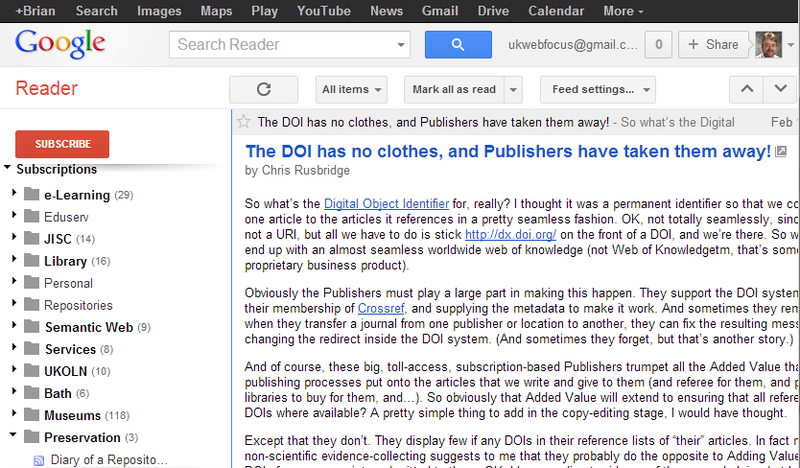 For me, as for many others who have been commenting on blogs today, Google Reader has been the ideal tool. What conclusions can we reach about the role of Web standards in light of Google’s announcement? The view that open standards protected the user from the vagaries of the market place seems to be undermined – in reality it seems that users grow to love tools which are embedded in daily use. It also appears that successful applications not only attract large numbers of users; successful applications can also attract developers and companies who can develop an ecosphere of applications which are dependent on services such as Google Reader. It also seems that social sharing services are undermining the use of RSS for bringing relevant content to users. Perhaps related to this will be the difficulties companies will have in monetising RSS feeds. It is interesting to see the arguments which have been made in the Hitler parody: Hitler finds out Google Reader is shutting down which is available on YouTube and embedded below. I’d be interested in other’s thoughts on the reasons for the closure of Google Reader and the implications of this announcement. Tony Hirst: @JoBrodie rss can make their data flow though – and the point about job ads is that orgs want them to be seen? Tony Hirst: @JoBrodie all the more reason to syndicate the ads – who’s going to look at a page regularly that only updates once a year? Despite such difficulties earlier this morning Tony has announced how he had taken a set of links listed in a post on Where London science communicators might work and used this to provide a Scraped and autodetected feeds resource of organisations working in the UK scientific communications community. How is UK HE Doing? I’ve described how a developer can make use of a feed of structured information across a community which can be used to provide benefits across the sector. As Tony put it, people looking for jobs aren’t going to continually revisit a job’s page which is updated infrequently, but aggregating job information across a sector can provide a continually updated resource which should be worth revisiting. – news feeds: the canonical example. News feeds can be used to pipe news around various university websites, and also syndicate content to any local press or hyperlocal news sites. If every UK HEI published a news feed that was autodiscoverable as such, it would be trivial to set up a UK universities aggregated newswire. – research announcements: I was told that one reason for putting out press releases was simply to build up an institutional memory/archive of notable events. Many universities run research newsletters that remark on awarded grants. How about a “funded research” feed from each university detailing grant awards and other research funding. Again, at a national level, this could be aggregated to provide a research funding newswire, as well as contribtuing data to local archives of research funding success. – jobs: if every UK HEI published a jobs/vacancies RSS feed, it would trivial to build an aggregator and let people roll their own versions of jobs.ac.uk. – YouTube uploads: you might was well add an autodiscoverable feed to your university’s recent uploads on YouTube. If nothing else, it contributes an informal ownership link to the web for folk who care about things like that. – your university Twitter feed: if you’ve got one. I noticed Glasgow Caledonian linked to their Twitter feed through an autodiscoverable link on their university homepage. – tenders: there’s a whole load of work going on in gov at the moment regarding transparency as it relates to procurement and tendering. So why not get open with your procurement and tendering data, and increase the chances of SMEs finding out what you’re tendering around. If the applications have to go through a particular process, no problem: link to the appropriate landing page in each feed item. – XCRI-CAP course marketing data feeds: JISC is giving away shed loads of cash to support this, so pull your finger out and get the thing published. Tony’s assertion that “most universities don’t seem to be supporting autodiscoverable feeds” is supported by the evidence from his UK HE Feed Autodiscovery app which trawls through UK HEI home pages. This currently reports that only ~38% of UK University home pages have auto-discoverable RSS feeds. Why are the majority of UK Universities failing to add a single element in the University home page for each RSS feed they would like to make auto-discoverable? In order to find an answer to this I have created a SurveyMonkey form in which I am inviting those who manage institutional Web sites to help provide a better understanding of the reasons for the low usage. I hope this will help to identify barriers and ways in which such barriers can be addressed in order that the vision of discovery of a whole set of useful resources across the sector which Tony has described can be implemented. Whilst reading this news earlier today I followed a link to Third Party Applications on the Develop WordPress.com site which currently only lists one application which is “built to work with WordPress.com and enable you to interact with your blog in new ways” – namely Memolane. I registered with the Memolane service for producing timelines some time ago but the connection with WordPress made me revisit the service. A display of my timeline is illustrated. I have configured Memolane to include a feed from this blog. In addition to a display of recent blog posts I have also included RSS feeds of areas of work for which several years ago I recognised that RSS could have a significant role to play. In particular I have included a link to the RSS feeds for my forthcoming events, previous events (for every year since I started in UKOLN in 1997) and for my peer-reviews and related papers. As show in the bottom of the image you can quickly display previous events, so I can find that in the latter part of 2000 I gave a talk on “Externally Hosted Web Services” on 12 October 2000 (well-before the current hype about Cloud Computing!) and a talk on “Approaches To Resource Discovery In The UK HE Community” at the Verity 2000 conference on 30 November 2000. It seems from this timeline display that life was much more leisurely eleven years ago, with the record of public engagement suggesting a six week gap between my activities! Of course I will have posted to email lists and written documents, but it is now difficult to see what I was doing back then. RSS feeds provide a means of keeping a reusable record of activities which can be processed by a variety of applications. This is the reason why I maintain a page of RSS Feeds For UK Web Focus Web Site and provide similar links for the QA Focus project which I was the project director for from 2002-2004. Despite a number of third party services having withdrawn support for RSS I am still convinced of the benefits of RSS. Those who make use of WordPress software either as a blogging platform or as a CMS will be able to exploit the feeds provided by the platform and many other services still provide RSS. The most significant gap in the services I make use of, however, is ePrints which drives our institutional repository service. Sadly ePrints support for RSS is very limited and so I am forced to maintain my RSS feed for my publications separately :-( It would be great if ePrints were to support the interoperably provided in a Web 2.0 world by RSS and not just the much smaller Library world based around OAI-PMH. But, as I asked last year: Is It Too Late To Exploit RSS In Repositories? A few years ago we had discussions about ways in which information about UKOLN peer-reviewed papers could be more effectively presented. We asked “Could we provide a timeline view? Or how about a Wordle display which illustrates the variety of subject areas researchers at UKOLN are engaged in?” The answer was yes we could, but it wouldn’t be sensible to carry out development work ourselves. Rather we should ensure that our publications were made available in Opus, the University of Bath’s institutional repository. And since repositories are based on open standards we would be able to reuse the metadata about our publications in various ways. We now have a UKOLN entry in Opus and there’s also an RSS feed for the items. And similarly we can see entries for individuals, such as myself, and have an RSS feed for individual authors. The Leicester Research Archive (LRA), in contrast, does seem to provide comprehensive set of data available as RSS. So, for example, if I go to the Department of Computer Science’s page in the repository there is, at the bottom right of the page (though, sadly, not available as an auto-discoverable link) an RSS feed – and this includes all 50 items. Sadly when I tried to process this feed, in Wordle, Dipity and Yahoo! Pipes, I had no joy, with the feed being rejected by all three applications. I did wonder if the feed might be invalid, but the W3C RSS validator and the RSS Advisory Board’s RSS Validator only gave warnings. These warning might indicate the problem, as the RSS feed did contain XML elements, such as which might not be expected in an RSS feed. But whilst my experiment to demonstrate how widely available applications which process RSS feeds could possibly be used to enrich the outputs from an institutional repository has been unsuccessful to date, I still feel that we should be encouraging developers of institutional repository software to allow full RSS feeds to be processed by popular services which consume RSS. I have for some time been a little nonplussed by our collective, continued obsession with the woefully under-used OAI-PMH. Other than OAIster (an international service), the only services I’m currently aware of in the UK are the former Intute demo now maintained by Mimas. In his post Nick goes on to ask “Perhaps OAI-PMH has had it’s day“. It’s unfortunate, I feel, that RSS does not seem to have been given the opportunity to see how it can be used to provide value-added services to institutional repositories. Is it too late? I’ve recently installed a widget on the sidebar of this blog which enables users to download an EPub or PDF format of recent blog posts (an idea, incidentally, which I got from the RSC MASHe blog). As indicated by my post on EPub Format For Papers in Repositories I’ve an interest in the potential EPub format so this blog provides an opportunity for testing various approaches to creating EPub resources. The widget uses the Feedbook service for creating the EPub updated link to ePub file) (and PDF<) formats. The service processes a blog’s RSS feed, so the number of items it converts is determined by the numbers of RSS items which have been selected in the blog’s administrators interface – for this blog there are 31 items in the RSS feed (this value was selected so that an RSS feed for the complete contents of the busiest month, July 2007, can be displayed). Due to performance reasons the Feedbook service only process the text in the blog so accompanying images, for example, embedded in a post will not be available. Via a recent comment on this blog I learnt about the Anthologize WordPress plugin which “is a free, open-source, plugin that transforms WordPress 3.0 into a platform for publishing electronic texts“. Using the plugin you can “grab posts from your WordPress blog, import feeds from external sites, or create new content directly within Anthologize. Then outline, order, and edit your work, crafting it into a single volume for export in several formats, including—in this release—PDF, ePUB, TEI“. However this plugin cannot be used for blogs, such as this one, which are hosted on WordPress.com. But in addition to the tools which can be used to create ePub version of blog posts I have a concern on how users who may have an interest reading blog posts (and other documents) on mobile devices will discover the availability of resources published in this format. I also wonder whether users will be confused if they click on the link will be confused when asked to select an application. Although Wikipedia provides a list of EPub reading tools none of them are particularly well-known. Will we see a repeat of the confusion which non-technical end users experienced when links to RSS became prevalent? I should also add that I’ve also an interest in process for easily getting blog posts on Kindle devices. I did wonder whether a PDF creation widget might be used in this process but 5 minutes of testing with a colleague’s Kindle was unfruitful. Hmm, in light of the interest in the new Kindle device I wonder whether we will see renewed interest in the PDF format, possible at the expense of EPub? Note In February 2011 I became aware that this service had been discontinued. The widget has been removed from the sidebar and replaced by a link to the Newstoebook service which provides a similar format conversion service. However in 2012, due to limitations of the service, this link was also removed. The importance of open data has been highlighted over the past few days with the Government’s public release of the Coins database. For those of us working in the public sector I feel there will be a need to move beyond the provision of Web sites designed for humans to the provision of open data for consumption by software, unencumbered by licence conditions which place restrictions on how the date can be used (a point, incidentally, raised yesterday by Tony Hirst in a post on “Time for data.ac.uk? Or a local data.open.ac.uk?“). This post describes how the data contained in Web sites for UKOLN’s IWMW events has been made available in RSS format, thus allowing reuse by others. The challenges in understanding the meaning of the data (which may have subtly changed over the years) and the quality of the data (which was not initially provided for use by others) is described, with conclusions provided for best practices in this area. The Web sites for all of UKOLN’s IWMW events since the event was launched in 1997 are still available in their original format. in 1997, 1998 and 1999 the Web site consisted of a couple of pages giving details about the events and providing links to the workshop materials. In 2000 we launched a more comprehensive event Web site which provided comprehensive details of the timetable, speakers’ biographies, abstracts of the talks and workshop sessions, information about the social; events, latest news, etc. We have continued with this approach ever since, although the look-and-feel of the Web site has changed a couple of times. This information was initially provided as HTML pages. However a few years ago we decided to make the key informational resources – speakers’ biographies, session abstracts as well as the latest news – available in RSS format. As described in a post on “RSS Feeds For Structured Information About Events” this enabled this data to be used by other applications, such as location maps of the speakers or Wordle displays of the session abstracts. We now provide access to comprehensive data (as opposed to Web sites) related to all 14 of the IWMW events which are available in RSS formats. These files are listed below. Note that the RSS feed for the abstracts of the plenary talks over all 14 years has been created using a Yahoo Pipe which aggregated the RSS feeds for the individual years. Yahoo Pipes are also available for aggregating the information for the abstracts of the workshop sessions and the biographical details for the plenary speakers and workshop facilitators are also available. Releasing data is one thing; understanding the data is another. One response to the Guardian article on the Government’s release of the Coins database commented that “This data is pretty much unintelligible to anyone outside of Treasury“. There are dangers that even simple data, such as the data files described above, may not be what they appear, the data may be inaccurate or links from the data may be broken. I feel there is a need to provide a statement about the data quality when making data available for reuse by others. In order to attempt to identify what might be included in such a statement I am summarising my knowledge regarding the data described above. Data files: This statement relates to the RSS files providing information about the speakers and workshop facilitators and the abstracts of plenary talks, workshop sessions and other events at UKOLN’s IWMW events from 1997-2010 together with location data for the events. File formats: The data is provided in a mixture of RSS 1.0 and RSS 2.0 formats. Workflow: The data has been manually migrated from the initial HTML formats. Description of the files: The files for the plenary speakers and sessions should contain information about speakers who gave plenary talks to all participants at the event and abstracts of the plenary sessions. This may also include panelists for panel sessions which were provided in plenary sessions. The files for the workshop facilitators and sessions should contain information about those involved in hosting parallel workshop sessions and the abstracts for the workshop sessions. Data elements: The files will normally contain a title (speakers or facilitators name, sometimes with the year, and the name of the talk or session, sometimes with a session code); a URL to further information about the speakers, facilitator or session, where this information is readily available; biographical details of the speaker, facilitator or session abstract, based on information provided by the speaker or facilitator and the data, and sometimes the time, the session was given. Risks: In light of the possible limitations of the data care should e taken in exploiting this data. Changes: The information provided in the RSS files may change as errors are fixed. When errors are fixed we will seek to regenerate a new RSS feed providing information which covers all years. We hope this summary of the limitations of the data files prove useful to anyone who wishes to make use of the data. Although we are aware of limitation in the quality of the data perhaps the biggest barrier to reuse of the data relates to the very limited links to other related information, Information about speakers and their host institution, for example, is provided as text strings and not links so we (currently) don’t provide links which allow the data to be easily integrated with other data stores. We are currently exploring ways in which we can migrate from an open structured data to open linked data. If and when such data becomes available we will provide a summary of the approaches used in the data migration and explore ways in which such data can be used. What Formats For Peer-Reviewed Papers? The papers I’ve written which have been published in peer-reviewed journals, conference proceedings or have been included in other types of publications have been listed on my papers page on the UKOLN Web site since my first papers were published in 1999. More recently I have made use of the University of Bath’s institutional repository – OPUS. Wherever possible I have tried to provide access to the paper itself. But what formats should I provide? The papers are initially written using MS Word and a PDF version is submitted to the publishers. I normally try to provide access to both formats, and also create a HTML version of the paper. The MS Word version is the master source, and so is the richest format; the PDF version provides the ‘electronic paper’, which preserves the page fidelity and the HTML format is the most open and reusable format. So all three formats have their uses. But none of these formats are particularly ’embeddable’. And even the HTML format is normally trapped within the host Web site. The HTML file also contains navigational elements in addition to the contents of the paper. Shouldn’t the full contents of papers be provided in an RSS format, allowing the content to be easily embedded elsewhere? And wouldn’t use of RSS enable the content to be reused in interesting ways? 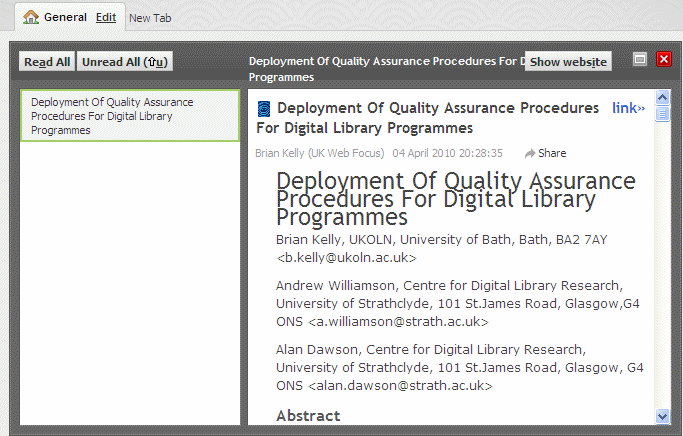 As an experiment I have created an RSS file for my paper on “Deployment Of Quality Assurance Procedures For Digital Library Programmes” which I wrote with Alan Dawson and Andrew Williamson for the IADIS 2003 conference. As well as the MS Word and PDF formats of the paper I had also created a HTML version. The process for creating the RSS file was to copy and paste contents of the HTML file (omitting navigation elements of the page) into a WordPress blog. I then viewed the RSS file using the WordPress RSS view of a page and copied this RSS file to the UKOLN Web site. My first test was to add the RSS version of the paper to Netvibes. As you can see the Netvibes RSS viewer successfully rendered the page. It should be noted, however, that internal anchors (i.e. links to the references) did not link to the references within the RSS view, but back to the original paper. I also tried FeedBucket, another Web-based RSS reader. In this case, as can be seen, the tool only displayed the first 500 characters or so of the paper. This seems to be a feature of a number of RSS tools which only provide a summary of the initial content of an RSS feed, with a link being provided for the full content. Since the content of the paper is available without the navigational elements and other possibly distracting content which may be provided on a HTML page, it is possible to analyse the contents of the paper. For this I used Wordle – if you wish you can view the Wordle cloud for the paper. Should we be providing access to papers in a mature and widely used format which allows the content to be reused in other environments using a wide range of readily available technologies? And which also allows the content to be processed and analysed using simple-to-use tools such as Yahoo Pipes? Hmm. So can I make the paper available in an RSS format as long as I include the ACM copyright statement? Back at UKOLN’s IWMW 2006 event Andy Powell gave a plenary entitled “Reflections on 10 years of the Institutional Web” in which he summarised the trends he had observed during the ten years in which UKOLN had been hosting its annual event aimed at members of institutional Web management teams. Andy used the JICSMail archives for the web-support list in order to search for early occurrences of technologies (such as RSS and CMS). This, however, was a time-consuming process; due to the lack of APIs to the JISCMail Web archives and anyone wishing to apply further analyses would have to start from scratch. We first provided a news page about the event at IWMW 2005 and ensured that this was also available as an RSS feed. We later realised that RSS could be used not only for providing news but also as an open format which would allow content to be reused by other applications and since then have provided a wide range of RSS feeds for the events, including details of the speakers and abstracts of the plenary talks and workshop sessions. But what might we learn if we make available RSS feeds for even further back? Might this approach make it much easier for those who wish to gain a better understanding of how the topics addressed at the events have developed over the years? This was the question we were looking to answer. 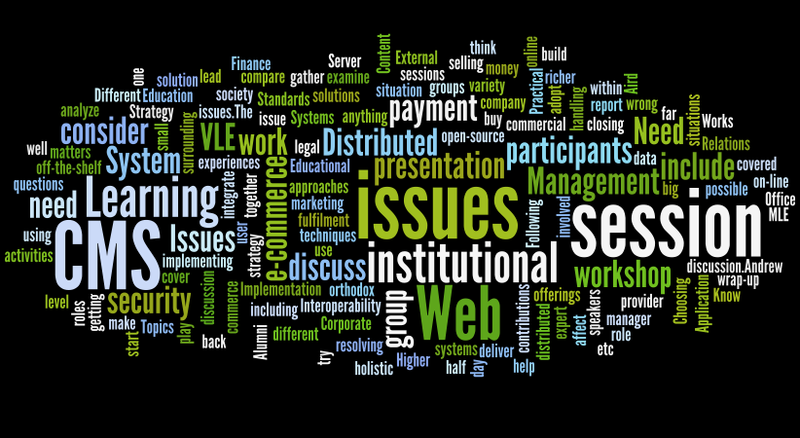 A Wordle display based on the RSS feed of the abstracts of the parallel workshop sessions at this year’s IWMW 2010 event is shown. We can see that topics such as ‘mobile’ and ‘location’ will be addressed in a number of the sessions. It is also interesting to see that ‘HTML5’ and ‘RDF’a’ also feature fairly prominently in the display as does ‘social’ – which relates to social networks and not the social aspects of the event. I should also add that this data is based in 17 parallel sessions which last for 90 minutes, from which participants can attend two sessions. But what was being discussed back at the IWMW 2000 event? I have created an RSS feed of the abstracts of the workshop sessions for that event, which was held at the University of Bath 6-8 September 2000. The format of the event was slightly different back then as, for IWMW 2000 only, participants could choose one from parallel sessions which lasted for three hours or two from four sessions which lasted for 90 minutes. 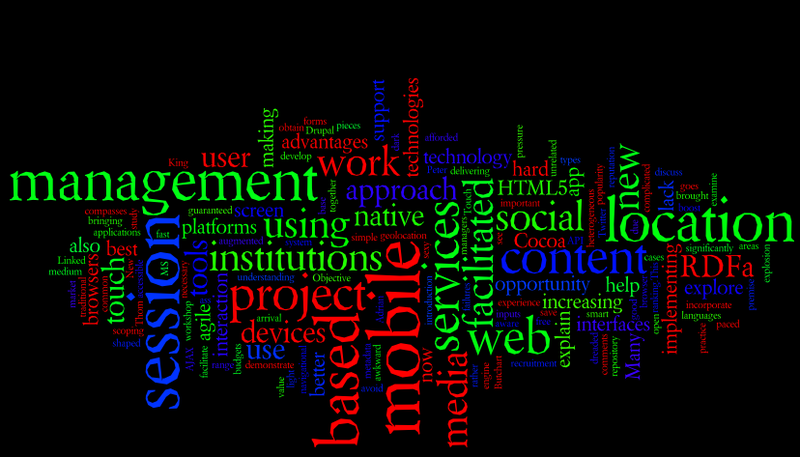 The Wordle display based on the RSS feed for the IWMW 2000 parallel workshop sessions is shown. This time we see that there is a strong interest in CMSs, which seems to have disappeared from this year’s event. There was also an interest in ‘VLEs’, ‘payment’, ‘ecommerce’ and ‘security’ which, again, do not seem to be being addressed this year (or, to my recollection, in recent years). A better understanding of changes since 2000 would be seen if redundant words (such as ‘institutional’, ‘web’, ‘management’, ‘workshop’, ‘sessions’ and ‘participants’) which probably occur in every abstract were removed. And in additional to the graphical capabilities provided by Wordle I wonder if more sophisticated text mining tools could be used to explore the changes in the topics which the community has been addressing over the 14 years which the IWMW event has been held. We have RSS feeds containing providing information on the plenary talks and workshop sessions for IWMW 2000-2010 together with biographical details for the plenary speakers and workshop facilitators since the event was started. Note that the RSS feed for the plenary speakers contains geo-location information of the host institution which means that we can also display a map showing the location of the host institutions of these contributors. The UKOLN Web site has a page which contains links to the RSS files – and note that information about an OPML file of the RSS files is also available. I have some ideas of how this structured data about the event (as opposed to HTML pages designed for reading by human) could be used – and it is useful to have data available for use with tools such as Yahoo Pipes. I also wonder if others have any suggestions on ways this data could be used? I also feel that other events should be providing RSS feeds of their event information in a similar fashion – especially those events which are well-established within the community. If the abstracts of the talks given at events such as national ALT, JISC and UCISA conferences held over the years were provided in RSS this should provide a valuable open and reusable resource to facilitate data-mining. And what about the Eduweb series of conferences which provide a similar role to IWMW for university Web team in US higher educational institutions? Shouldn’t such high profile conferences aimed at technically advanced user communities be taking a lead in providing structured information about the events? Isn’t there a danger that in only focussing on the future we fail to learn lessons by looking at out past? 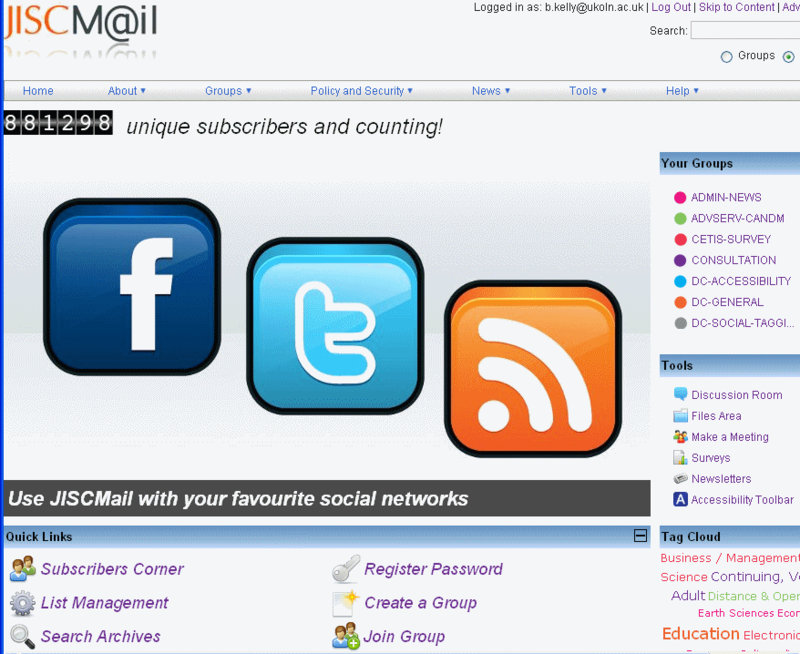 As announced yesterday on the JISCMail Owners list the JISCMail home page has been updated – and I’m pleased to see that it now provides a personalised interface, with the list of subscribed groups displayed once you have logged on. It is also interesting to observe the high profile the service gives to Facebook, Twitter and RSS as can be seen from the rotating advertisement illustrated in the screen image below. It seems that when you view an individual message you can share the post on a large range of social bookmarking and sharing services such as Facebook, Twitter, Slashdot, Diigo, Bebo, etc. as illustrated. Whether such a large number of services is useful to the end user may be uncertain. It will also be interesting to see how this works for closed groups. But perhaps this facility demonstrates a move towards allowing great sharing and public reuse of the contents of the JISCMail mail archives – an approach which I would warmly endorse. A few months ago I attended a meeting which discussed future developments for the JISCMail service and there was broad agreement on the benefits which could be gained by allowing the archives of messages to be more easily reused outside of the JISCMail environment. Allowing messages to be bookmarked and reused in other Social Web sites is a useful first step. This development follows on from an announcement in the March 2010 issue of the JISCMail newsletter of a facelift to the individual mailing list archive pages. Again I am pleased to see the developments. The home page for individual lists is much cleaner than it was previously. 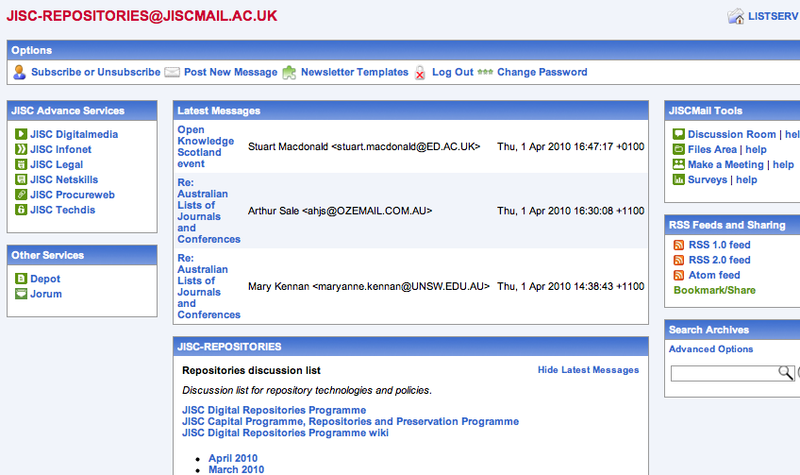 It provides separate areas for recent messages and message archives,with the right hand sidebar being used for tools related to the list and the left hand sidebar providing links to a number of other JISC services (although I have to say that I suspect that such links won’t be of interest to most users – since the home page for lists may be where users typically arrive rather than the JISCMail home page I feel the list of subscribed lists would have provided a more relevant use for this area of the page). The development which is of most interest to me, however, is the RSS Feeds and Sharing links which provide access to RSS 1.0 and 2.0 and Atom feeds for posts to the list. This is illustrated for the JISC-Repositories list below (see menu of right hand side of screen). LISTSERV automatically creates RSS abstract from the text part of the message. By default, LISTSERV uses a maximum of 500 and a minimum of 250 words for an implicit RSS abstract. You may wonder why I would wish to have JISCMail messages delivered to my RSS Reader. The answer is that I normally subscribe to JISCMail daily digests and although the format of the digests is fine for viewing on my PC, I can’t access the content on my iPod Touch (or on my Macintosh where I receive the error message “Mail was unable to open the URL “cid:1925@JISCMAIL.AC.UK“). But perhaps I should accept such limitations which make reading JISCMail message slightly irritating, but not an insurmountable barrier. Of greater concern is the limitation the limit places on reuse of RSS by other applications besides RSS readers. It could be useful, for example to be able to use a list archive’s RSS feed as a generic structured output format to allow the contents of a list to be visualised by a service such as Wordle. An example of a Wordle cloud for the JISC-Repositories list is shown, which uses the JISC-Repositories RSS 1.0 feed as the data input: possibly an interesting visualisation of the topics being discussed on the list, but its usefulness is undermined by the arbitrary truncation of the content of the individual messages. (Note that you can view the latest Wordle cloud for this list). This example provides a visual illustration of how RSS feeds for mailing lists could be used to provide functionality which is not provided by the mailing list service itself. Other examples could be provided by RSS processing tools such as Yahoo! Pipes. It might be possible, for example, to take an RSS feed from a list (or a number of lists), filter them using Yahoo Pipes filtering capabilities and feed the output into other applications which process RSS. Tony Hirst’s OUseful blog, for example, is full of examples showing various ways in which RSS can be used to provide new insights into content. To be fair, though, the JISCMail service isn’t alone in providing a limited use of RSS. I had hoped that the University of Bath’s Opus repository service, which is based on the ePrints software, would support a variety of full RSS feeds but the RSS feeds for my papers and UKOLN papers are both limited to 10 entries. So I feel that JISCMail is on par with the version of EPrints which I have used – it’s good to see both providing RSS feeds but I hope that future releases of the software with provide greater support. Is it possible to take an individual post from this blog and reuse it another environment? You can take the most recent blog posts (which I’ve currently configured to be the 26 most recent posts) and reuse them in another environment using the blogs RSS feed. The most recent posts can be viewed in a personal RSS reader, displayed in a public RSS viewer such as Netvibes, fed into a service such as Wordle to create a word cloud, etc. But what if you want to do something with a post which I created a while ago, such as the An Opportunities and Risks Framework For Standards post which was published in January 2010?. Can that post be reused in ways other than just linking to the page? The answer to this question was provided by Tony Hirst in a post on Single Item RSS Feeds on WordPress blogs: RSS For the Content of This Page which he wrote in July 2009. Unlike many of Tony’s development activities which Tony describes on his OUseful WordPress blog, his solution does not involve writing code; rather it is based on a standard, but seemingly not widely-known feature of WordPress blogs – the ability to create an RSS feed for any page which is displayed. The end user viewing one of your blog posts will be able to click on the link “RSS Feed for this page” and get an RSS view of the post. This RSS file can be used with a variety of RSS tools – what you have provided is a simple mechanisms for reusing A HTML resource (the Web view of the blog post) into a much more reusable format. Tony pointed out that this trick can be used not only for an individual blog post – in can also be used for various views for a blog post. If you look at my posts for January 2008 or for the category Standards, for example, you will see the “RSS Feed for this page” link, and if you click on the link you’ll can an RSS feed of posts published in January 2008 or posts with the category Standards. One caveat I should mention, though, is that the total number of items in the RSS feed is limited to the number specified in the blog’s configuration file. As mentioned above, the limit for my blog is 26 items. As I published 31 posts in July 2007, not all posts will be included in the RSS feed for the month. Similarly the RSS feeds for the year and for popular categories will not necessarily contain the complete set of relevant posts (unless I set the number of RSS items to a very large number, which could result in causing problems elsewhere, such as users of RSS reader who might understandably expect to see only the most recent posts). Recently Paul Milne left a comment on this blog wondering why the “RSS Feed for this Page” link was provided, as it appeared to replicate the functionality of the blog entries RSS link. I have to admit that the purpose of the link is not obvious. I hope this post provides an explanation of the benefits which this contextual RSS feed can provide. And I’d encourage other WordPress bloggers to make use of this little-known feature provided on the WordPress blogging platform. Saturday’s Guardian has an article on ‘Nudge’, an idea developed by US economist Richard Thaler and other behavioural economists who “want to highlight the best option, while still leaving all the bad ones open“. This approach can be applied to social and economic areas such as healthy eating and pension schemes, but rather than the state mandating solutions which aim to bring about positive benefits to society or to individuals, people are made aware of the benefits of the preferred option, but are left free to make their own decisions. An example of this approach which David Cameron is exploring in the Conservative party return to power is a proposal that electricity bills should contain details of whether you are using more or less energy than other households in the area. This subtle use of peer pressure is felt to encourage households to use energy more efficiently. This has similarities with approach I’ve taken over the past ten years or so. A project called “WebWatch” ran a number of automated benchmarking surveys across a number of Web communities in 1998-9. After the funding had ceased the approach continued for a number of years, providing, for example, documented evidence of conformance with WCAG guidelines for institutional home pages based on use of an automated checking tool. The approach was not intended to act as a league table, but to observe patterns across the community, identify and learn from best practices and also to discuss the limitations of the survey methodology (in this case it led me to a much better understanding of the flaws in the WAI model for addressing accessibility issues). With the forthcoming IWMW 2008 taking place in the University of Aberdeen on 22-24thJuly 2008 it is timely to revisit the WebWatch approach across the Scottish higher educational sector, this time to monitor takeup of RSS which are embedded on institutional home pages. The approach taken has been to visit Scottish institutes of higher education (based on the table provided on the Scottish Web Folk blog) using the FireFox browser. The RSS Panel extension will detect any embedded links to RSS files and the numbers of RSS links recorded. The findings are given in the following table. It is perhaps disappointing to find that several Scottish institutions do not appear to be providing RSS feeds which can be found from the home page. A number of them do provide a feed, which is displayed using one of the conventional orange RSS icons to indicate its role, but do not provide an autodetect mechanism, which can enable software to process the RSS file in some way. An example of how the Internet Explorer browser provides access to RSS feeds which have been autodetected is shown below. Why, I wonder, aren’t all the institutions which have an RSS feed doing likewise? After all this approach can not only benefit end users, it also allows other automated tools, such as indexing robots, to find the feeds – and I suspect most institutions will want their news feeds and details of their events to be found. Perhaps the reason for not doing this is a lack of awareness – in which case I hope that this post has addressed that issue. But it may be that changes to the content of the home page have to be approved by a committee – and suggestions for “inclusion of an autodetect link for RSS feeds” might be regarded as technobabble. In which case show them the business benefits and show how other institutions are using this. My final comment on the findings of this survey is to note how the Scottish Agricultural College (SAC) have included links to seven RSS feeds, including not only the conventional lists of news and events but also various other feeds for content which is directly related to their agricultural interests. Here SAC is making use of RSS as a syndication service in addition to an alerting service. An image showing how these feeds can be displayed using the RSS Panel tool in FireFox. I should hasten to add that on arriving at a page which has autodetectable RSS feeds the panel is displayed as a small transparent floating window – you need to open up the window in order to display the feeds as shown. How usable this particular tool may be for processing more than one or two feeds may be open to question – I tend to just have one or two RSS feeds on my various Web sites, and have a dedicated RSS page which provides access to a full range of feeds. But I do think that the approach taken by the Scottish Agricultural College, of providing a number of structured resources (using RSS) is one to be welcomed. And I wonder why the Scottish Agricultural College seems to be ahead of the game. The talk I gave on Web 2.0: The Potential Of RSS and Location Based Services in Edinburgh in September 2006 didn’t have anything to do with this, did it? The thumbnails of the institutional home pages were created by the Thumbshots thumbnails service. We have a number of remote workers at UKOLN, with staff based in the south west, south east and north of England and Scotland. We are making increasing use of networked technologies to support the remote workers – with a workshop session on “Embracing Web 2.0 Technologies to Grease the Wheels of Team Cohesion” being given by my colleague Marieke Guy together with Andy Ramsden, head of the e-learning unit at the University of Bath at this year’s IWMW 2008 event. When preparing for a recent training course on “An Introduction To RSS Readers: Google Reader and Netvibes” I thought this would provide a useful opportunity to explore the potential of screencasting, which is described in Wikipedia as “digital recording of computer screen output“. In my case I used the Camtasia software to record the screen display together with my accompanying audio description of what I was doing. I had also created an accompanying PowerPoint presentation which acted as my script. I had intended to also sync the sound with the PowerPoint slides to create a Slidecast on the Slideshare service, but didn’t get round to doing this, this time. Initially I had intended to make this available just for colleagues at UKOLN (the remote workers and office-based workers who couldn’t attend the session). But it strikes me that the screencast may be useful to others – and, indeed, a colleague of mine commented that “I found it useful to have the seminar available in this version (I was on holiday on the day of the seminar). As a remote worker, I would welcome similar initiatives for future seminars.” So although it isn’t as polished as a professionally made video I thought I would share it with readers of this blog. A question I would have is should we encourage the production and sharing of such screencasts more widely? Would you be willing to do this for training sessions you may give? And, if you’ve watched it, how useful have you found this screencast? Note: via Phil Bradley’s blog I came across a post on Common Craft and Google Reader which provides “a new short video just over a minute long demonstrating Google Reader“. [This note added on 1 Sep 2008]. Over the past few years UKOLN has made use of RSS to support its annual Institutional Web Management Workshop (IWMW) series. Initially RSS was used to provide access to news about the event, allowing delegates to be alerted to updates about the event without needing to visit the Web site, thus allowing users the choice of avoiding the intrusiveness of email. But as more applications and Web-based services became available which exploited RSS, we started to appreciate the wider ranges of potential uses for RSS. Since 2006 we have used RSS to syndicate structured data for the event, including, as can be seen for this year’s event, lists of the plenary talks, workshops sessions, speakers and workshop facilitators. This frees the data from the constraints of the event’s Web site allowing the data to be accessed by users in more varied ways including the user’s preferred RSS reader, PDAs, mobile phones and even, using an RSS iPod Reader, having this data conveniently available on a iPod. More recently we have made use of geo-located RSS data to enable the locations of the IWMW events to be displayed on a map. This then led to a geo-located RSS feed of the host institution for plenary speakers at all twelve of the IWMW events (including this year’s event, to be held at the University of Aberdeen on 22-24 July 2008). This provides the event organisers with a management tool which can help to visualise the participation at the event on a geographical basis – have we, for example, provided opportunities for plenary speakers from throughout the UK? 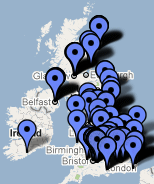 I’m pleased to say that we do seem to have a broad representation throughout the UK, will speakers from as far north as Aberdeen, as far south as Southampton, as far east as Norwich and as far west as Belfast. In addition, if you zoom out from the UK you will discover that there have been a number of speakers from overseas including the Republic of Ireland and Australia. In a recent post on RSS For Your Project Web Site I cited Stephen Downdes’ comment that failing to provide RSS is unsocial. But a couple of people posted comments and argued that RSS only has a role to play in specific cases. I disagree, as I feel that providing RSS feeds for structured data can allow the data to be used in interesting, and perhaps unexpected ways. Let’s make much more use of RSS generally, I would say. But how else can it be used to enhance events, I wonder? And are there any developers reading this post who might be in a position to submit an entry to the IWMW 2008 Innovation Competition which makes use of this data? Stephen Downes has recently suggestedthat use of RSS and blogs “should be basic and fundamental information, and in my view, projects without this sort of informational support are just being anti-social.” I think Stephen’s right – although, as a Brit, I’d probably be more circumspect (perhaps along the lines of a Sir Humphrey Appleby “Is really it wise not to have a RSS feed“). Stephen’s direct North American approach is to be applauded, I feel. And Stephen linked to a blog post on RSS injects edu with accuracy, freshness, and cool stuffwhich gives an example of how RSS can be used. 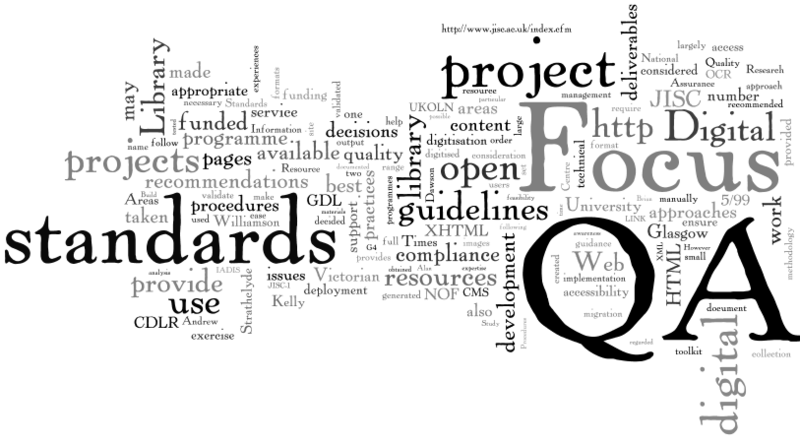 My own use of RSS to enhance access to project deliverables was for the JISC-funbded QA Focus project. In this case RSS filesprovided for the project’s key deliverables including briefing documents, case studies, papers and presentations. In addition OPML fileswere also created which enabled the RSS files to be integrated in a variety of ways. Stephen’s right – if you’re not doing this you are “just being anti-social“. This extract from Hansard only really tells me one thing: there isn’t a government-wide standardised hit-tracking/visitor analysis scheme. Great, we have a standard which can be used for measuring Web usage. The problem is, what if the content of a Web site is syndicated? What if users don’t visit the Web site to read the information, but expect the information to come to them, via their preferred RSS reader? This struck me when I viewed the usage statistics for my initial post on The UK Government and Web Metrics. At one stage all I could view via the administrators interface on the WordPress.com service was the overall hits on pages on my blog. But some time ago WordPress provided a display of syndicated accesses to blog posts, as can be seen in the image. Now what would I report on the day the post was published if I was making use of the ABCE’s standard for Web site usage? Less than 40 page views on the day the post was published, and a drop in views after that. The statistics showing the much higher syndicated views of the post would fail to be reported. OK, so the usage data is flawed – but everyone knows that. The danger, of course, if usage data becomes competitive, with services failing to be funded if the usage levels as recorded by Web site visits doesn’t reach acceptable levels. And what will providing RSS feeds to services do – it may provide a richer and more personalised ervice for the end user, but the Web usage figures as reported by tools which comply with the ABCE standard will drop. Here’s an example of how use of an agreed international can potentially result in a failure to develop richer service for the user community. Now I’m not saying that we shouldn’t have an agreed baseline for usage statistics. Rather the Web site usage needs to be analysed in conjunction with an understanding of alternative ways in which users may access the data. And I don’t know if there’s a standard available for this. When a new comment is made on this blog I receive an email alert. And details of the last 5 comments are included in the sidebar widget. But how can readers of this blog find out about new comments made to postings of particular interest, especially if they miss the information in the sidebar (which can happen if several comments are made in quick succession, if they don’t visit the blog site regularly or, indeed, if they use an RSS reader, email delivery of postings, etc. This occurred to me after receiving a comment on the FireFox – The Researchers Favourite Application? posting from Peter Miller, in which he mentioned that Mike Kaply, the Firefox Operator guy, is blogging on enterprise deployment. There has been a fair amount of interest in this topic (indeed the post is in the list of top postings in this blog) so it would be unfortunate if people missed this useful link on developments in this area. WordPress does provide an RSS feed for new comments. Perhaps I should provide a link to the feed in the sidebar. But, as has been discussed previously, many users don’t know what to do with RSS feeds, so should I provide a link to an email delivery of RSS feeds? But won’t this be confusing – what will receiving notification of a comment mean without the context? Or do they applications provide information about the context? And do RSS readers solve this in any case, so there’s no need for me to make any changes (and to add more clutter to the sidebar)? Outlook 2007 – A User-Friendly Interface To RSS? I recently suggested that services, such as R-info, which provide an email delivery service for RSS feeds could be a useful way of maximising access for users who are not comfortable using a dedicated RSS reader. However having noticed Michael Webb’s posting on Outlook 2007 – the killer RSS application? perhaps the much-needed simple interface will become more widely available as MS Office 2007 becomes more widely deployed. As can be seen from the accompanying screen image (taken from Michael’s blog) Outlook 2007 seems to provide an interface which will be familiar to users who make use of folders to organise their blog postings. Roddy MacLeod recently pointed out the difficulties end users may have in understanding how to add RSS feeds to RSS viewers. I think Roddy is right – and we do need to make interfaces much easier to use, especially for users who make use of email and Web browsers, but don’t understand RSS readers. In response to this I recently subscribed to three services which deliver RSS feeds using email. The services were R-Mail, RSSfwd and Feedblitz. At the delivery end, the services seem similar: with all of them I received a HTML-formatted email, with embedded images. The Feedblitz subscription service seems to be the most sophisticated, allowing the delivery to be suspended (perhaps when going away on holiday) together with a host of other options which can be accessed from the dashboard, as illustrated. However as the aim of this service is to provide an interface which is very easy to use, especially for the inexperienced user, I have chosen the R-Mail service, and provided an interface to this at at the top of the right-hand sidebar widget. I recently received a copy of “Hero Headlines” which contains news from Hero Ltd, “the company behind the UK’s official online gateway to higher education and research opportunities“. The newsletter included an article about the new-look HERO Web site, which was relaunched in November 2006. The article mentioned that the Web site now makes use of RSS. Looking at the What is RSS? page I was pleased to find that RSS is being used not only for news, but also for syndication of feature articles and press releases. In addition the Web site explains what RSS is and provides helpful advice on using RSS readers. Well done, Hero. I think a national portal to UK Universities, such as Hero, helps to maximise awareness of and access to information about the sector. (I should disclose, BTW, that I was a member of a Hero Technical Advisory Group, several years ago). I’ll talk some more about these issues in future postings – but for now I’d be interested in what you might like to see from a national portal. A standard of much interest to us at UKOLN is RSS. We came across RSS in its very early days: I gave a workshop session on Automated News Feeds at the national Institutional Web Management Workshop back in June 2001 and Andy Powell, a former colleague, included RSS is the JISC Information Environment technical architecture. I recently discovered that UKOLN RSS feed did not validate, according to the Feed validation service hosted at the W3C. The error appeared to be with the <taxo> modul, but a colleague was convinced that the feed was fine and the problem was with the RSS validator. I was sceptical (surely an open source validation service, hosted at W3C, can’t have a bug in such a fundamental area) and raised this issue on the web-support JISCMail list. Sebastian Rahtz pointed out errors in the examples given in the RSS specification, which made me wonder whether the specification itself was flawed. When I found out that our news feed was created by the RSS::XML module, I wondered if the error could possibly be in this module. I raised this issue on the W3C’s QA list, asking whether the problem was with (a) our RSS feed; (b) the RSS specification; (c) the application used to generated the feed or (d) the RSS validator. I received a prompt response from Olivier Thereaux (first thing the following morning) which confirmed that our feed was fine; that there were errors in the RSS specification (in particular in an example included in the spec) but that the fundamental error was due to a bug in the validator. This was reported to Sam Ruby, the developer of the validator who, a few hours later, implemented a patch and released this on the main Feed Validator site. I was very impressed with the speed with which this problem was addressed and a solution deployed. Many thanks to Olivier and Sam for this. The development community would have spotted bugs in an open source applications, through the ‘many eyes make all bugs shallow’ principle. The W3C QA processes would have detected this problem prior to the installation of the service on the W3C Web site. A colleague pointed out that software developers (which I am not) tend not to have so much faith in validators, and many important and widely deployed applications have bugs. I am not the only person to have concerns over the lack or resources allocated to this important area: Bjoern Hoehrmann left the W3C QA in July 2006, sending a message to the public-qa-dev list giving his reasons for leaving the group. Where, then, does this leave me? How can I advise others of the importance of validation and of systematic QA processes if such processes don’t seem to be in place with the W3C? Should I stop writing and giving talks on this (I suspect people’s eyes do glaze over when they hear me harping on about this issue). But on the other hand, if digital library development programmes are being funded on the assumption that the data and formats are ‘clean’ aren’t services going to break, if this isn’t the case? And perhaps I’m being over-dramatic over this one incident – the problem may have been an obscure one and at least the bug detected a false negative (it reported that a valid RSS file was invalid) rather than a false positive. And, as I said, the bug was fixed very speedily. So maybe I should continue to promote the importance of compliance with standards – but the wider development community should help to validate the validators. And for formats owned (or, as in the case of RSS 1.0, closely affiliated with) W3C, the W3C QA Interest Group has demonstrated that concerns don’t disappear down a black hole.